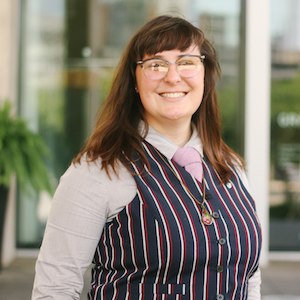 Anne Marie began working with Michigan League of Conservation Voters during the spring of 2017 as the West Michigan Regional Coordinator bringing her leadership and passion to engagement and organizing efforts in the West Michigan region making Michigan’s land, air, and water a political priority. In her role at Michigan LCV, Anne Marie manages leadership development programs, supports members and partners to participate in democracy, and managed a state-wide field program during the 2018 election in Michigan to elect pro-conservation candidates. Prior to joining the Michigan LCV, Anne Marie served as the Community Activism Manager at the West Michigan Environmental Action Council where she led diversity, equity, and inclusion initiatives and community engagement programs. In 2017, Hertl was selected as a National Equity Project Leading for Equity Fellow, a graduate of the Racial Equity in Action Leadership (REAL) Center, and is on the leadership team of the Greater-Grand Rapids Racial Equity Network. She graduated with a Bachelor’s Degree in Political Science and Community Leadership from Aquinas College. Anne Marie grew up near Cleveland, Ohio and has lived in Grand Rapids for ten years. Favorite Place in Michigan: PJ Hoffmaster State Park. Or, any golf course. You can reach Anne Marie at annemarie@michiganlcv.org.